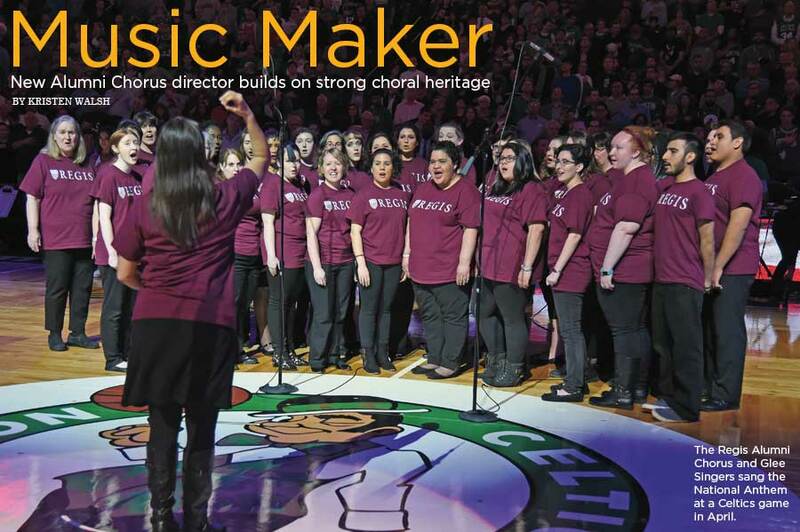 The Regis Alumni Chorus and GleeSingers sang the National Anthem at a Celtics gamein April. The Alumni Chorus recently welcomed a new director, Elizabeth Smith, PhD, ’04. Smith took over upon the September 2016 retirement of Sheila Grace Prichard, a longtime favorite conductor who founded the program in 1993. “I’m excited to bring in new ideas with regard to style and repertoire selections while also continuing to preserve the heritage of choral excellence Regis is known for,” Smith says of her role. She is particularly excited about new compositions. This year’s spring concert will feature mass movements composed by Smith along with Director of the Glee Singers and the Chamber Singers Heather Josselyn-Cranson, ThD, OSL, associate professor of music and Sister Margaret William McCarthy Endowed Chair of Music; and Douglas Anderson, Instrumental Ensemble director. The name change from “alumnae” to “alumni” came in 2015 when the chorus went coed after Joe Osborn ’13 joined the choir. Smith embraces how the group is ever-evolving. She enjoys experimenting with new performance venues and forms; for example, the Alumni Chorus performed at its first sporting event this spring—a Boston Celtics game where they sang the National Anthem with the Regis Glee Singers. She is also committed to continuing to emphasize the CSJ theme of service. The next Alumni Chorus tour is to Florida in 2018, which will involve singing at Disney World, in a retirement community, for Regis alumni and friends in Naples, and at a high school recruiting event in Fort Lauderdale. Alumni Chorus singers range from newly graduated members of the Class of 2016 to members of the Class of 1950 to members of the CSJ community and “everywhere in between,” according to Smith. The program is also open to the broader Weston community. Connections among members go beyond music. Smith is not new to the world of music at Regis. As an undergraduate, she sang with the Glee Club and Chamber Singers, co-led the music ministry program, and rang in the Handbell Choir. She was Prichard’s assistant conductor from 2004 to 2014. And for those who haven’t yet discovered a love for singing? Alumni Chorus rehearsals are held Mondays from 6:45 to 8:45 p.m. in the Fine Arts Center room 201. Drop by or email elizabeth.smith@regiscollege.edu.